Back in the Summer of 2012 we were seeing just how new technology and new social platforms were changing how we viewed the media internship. A key pipeline of talent for many organisations, Interns can’t be taken for granted. But what more can companies do? Will university careers services become a thing of the past? And will internships become an affordable alternative to university? 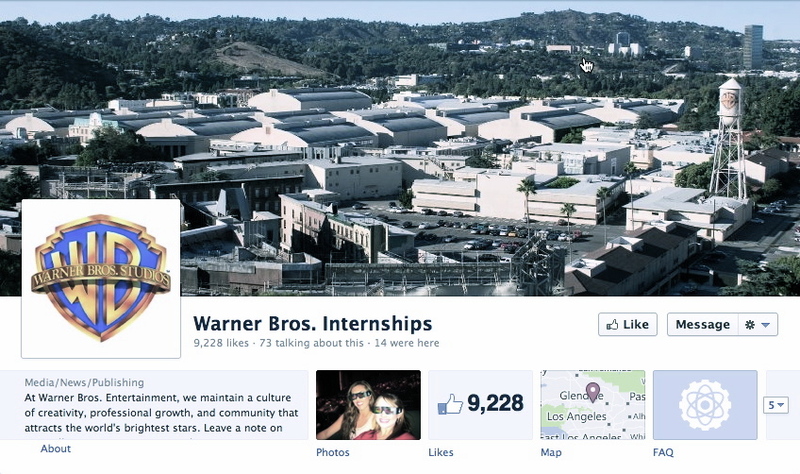 At the Warner Bros HQ at Burbank, California, the main focus for interns is in the area of gaming and digital/new media. So, the central point for their intern recruitment is a Facebook page that has over 9,000 ‘likes’ – which is more than many European universities! Yes, it’s a transient audience. But the engaging content means that the page has high levels of activity with people checking out the videos taken and posted by WB team members. However this page goes beyond merely advising on routes to WB internship. There’s plenty of general career advice provided through videos, tutorials, interview tips and more. So whilst only a small percentage of people will get to go on a placement, the page offers a good experience to all and enhances the WB brand. People are even blogging about it. The UK Facebook page also has an impressive number of likes and shows how some big names can provide a full intern application cycle without contacting universities or involving careers services. They can directly engage with their audience like never before. The emergence of online media intern networks is not surprising. After all, it’s difficult to imagine a subject area in which evidence of proven practical experience is so important to get a foot on the ladder, never mind to ignite a career. In the years before the Internet it was widely accepted that a job at the Student Union Newspaper, or on the radio team, was a hugely valuable step. Now the opportunities are vast. Yet one challenge remains constant: getting paid for what you do. Whilst the healthy argument is that students should get paid for their internships, the classic supply-demand equation prevails. Employers have so many students to tap into; and so many students are still willing to do the work for next to nothing (or nothing at all). Consequently, the internship where only expenses are paid for is still very much in fashion, with exceptions of course. Trawling the web for paid internships in media, it is interesting to note that most of the jobs available are really sales jobs. Paid experience in the creative hub of media is still quite elusive. However, there are some opportunities, notably within universities themselves. The abundant trend for co-creation of media work is very much alive in Higher Education. Institutions are craving the authenticity that their own students can provide when promoting the campus as a place to study. Whilst they have experts that teach media, many universities recognise the difficulty in keeping ahead when it comes to social media, and they all want to use these minimal cost channels to promote their messages. They can find the expertise, and the appetite, within their own student cohorts. For this reason we are seeing more and more institutions employing teams of student journalists and creatives to help them in their marketing communications. And very often the students get paid too! We are also seeing the rise of virtual internships. This makes sense because it is reflective of the changes within the world of media and communications, with more and more work being conducted via laptops on wifi, through Skype and across geographies. Check out some of the stories out there and the links to blogs and real-life experience. One of the many stories includes a student taking a 6 month internship with a digital media company in the UAE, without leaving his desk in Sweden. At the same time, we are seeing media companies making virtual internships a fundamental part of what they do. The development of this virtual approach has a particularly special benefit too. There are so many students with aspirations to work in media, yet they don’t live or study near any significant hubs of activity. Now though, a journalist student in Preston can work for a media owner in London without having to spend months on a friend’s sofa in the capital. Thankfully the media world is embracing this opportunity. But virtual internships are reaching so much further. In the US we are seeing a significant growth in virtual internships in China and this Bloomberg report from March 2012 offers a good summary. It’s definitely all change!